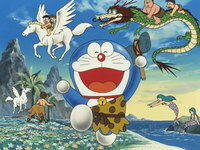 Plot Summary: As Doraemon, Nobita, Shizuka, Jyaian, and Suneo decide to run away from their homes, they flee towards 70,000 years back in time. 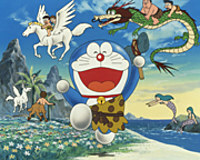 After a brief exploration of prehistoric Japan, they end up meeting Kururu, a boy from the primitive era. To help him reunite with his tribe, Doraemon and the gang will need to fight a shaman from another tribe who has captured Kururu's kin to work as slaves.